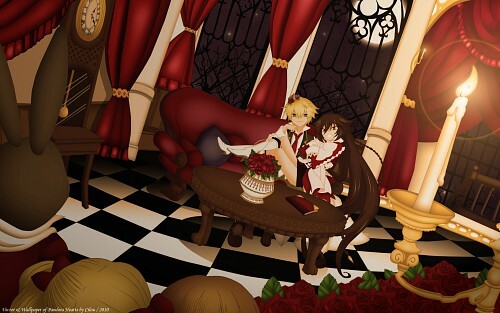 Pandora Hearts Wallpaper: Welcome in our Kingdom! Minitokyo »	Pandora Hearts Wallpapers » Pandora Hearts Wallpaper: Welcome in our Kingdom! Hi! That's a real hard work! First I vectored all elements of the room of Alice/Abyss that I scan from the book (first tome). Since I search a scan of Pandora Hearts that fits the BG (found on internet since a long time ago) and I made the vector of Oz and Alice. I wanted make something warm and happy, they seem to have fun! Finally I worked light, color, etc to reach this atmosphere. I spent a long time to make this, and have fun too! I hope you'll like it! This wall is just badass ! Everything in it is just perfect ! +fav and thx for sharing Cilou san ! This would've looked so much better if only you had put more time and effort into it instead of rushing to finish it and submit it so soon. The outlines/lineart really do look awful - the circles in the table look too skewered and uneven, the candelabrum also looks like it had been outlined by hand of some 5-year-old and not vectored, the hair lines and those black bars in the background don't look curved at all plus many other tidbits and details that should've looked better but look messy and halfassed instead. All in all, this needs a lot more work; you have so much potential but you waste it on producing wallpapers too quickly and not concentrating enough on details and crucial things like lighting and depth. Love the colours , the BG, the couple and everything. The creation of perfect balance between the vision of dark,gothic objects ( moon, dolls,red roses and curtains) and the bright candle light atmosphere. Fabulous work n keep it up! So pretty and i love the perspective.. It is really nice wall! This had so much potential :/ but I totally feel you rushed with this wallpaper. Sadly everything looks extremely flat, you should have spent more time taking care of the shading and adding proper textures. Same goes for the outlines, the look awfully jagged and the you can clearly see that the curves aren't really curves...which I don't really understand since you vector so much. I think it sorta means you seriously need to take more time before submitting a wall. The best one~~~! very cute indeed~~! Thanks for sharing this! I like it very much! Oz and Alice are a pretty good pairing!